Our volunteers are trained to be good listeners, to be sensitive to callers' distress and to explore feelings, including those which may lead to suicidal thoughts. We do not tell you what to do, but by listening and talking through your feelings, we hope we will be able to help you get through difficult times. You don't need to be experiencing suicidal feelings to contact us; however if you are, you can be sure of an understanding and non-judgmental listening ear. If you'd like to talk to a Samaritan face to face, we are open to receive visitors from 7.30am to 9.30pm every day. No appointment is needed, you can just turn up. The building is on the corner of Wheatfield Way and Palmer Crescent. Please come to the entrance on Palmer Crescent (green door). There is no charge for this service. Step free access to building as well as lift and wheelchair accessible toilet facilities. 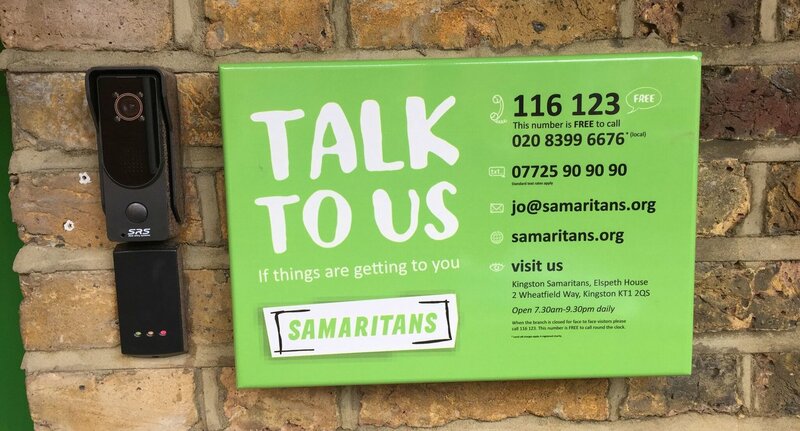 Kingston Samaritans have been providing emotional support to our callers in the local community (Kingston, Surbiton, Esher, New Malden and Richmond) since 1968. By providing emotional support on the phone and by email for anyone who is struggling to cope including those who have thoughts of suicide. By being available to residents across the borough who wish to to visit us to talk to a Samaritan face to face. By reaching out to high risk groups and communities to reduce the risk of suicide. By providing support locally through our various Outreach activities, including working in partnership with Network Rail and Wandsworth Prison. By running workshops and events in schools throughout the community and supporting events at both Kingston University and Kingston College. Donate through our Just Giving page. Volunteer with us as a listening or support volunteer. Follow @sams_kingston to keep up-to-date with what we're doing and share our message on Twitter. Help us with our branch fundraising efforts. Kingston Samaritans, a charity registered in England (1168320). Kingston Samaritans is a recognised branch of Samaritans.